Want to see something painfully adorable? 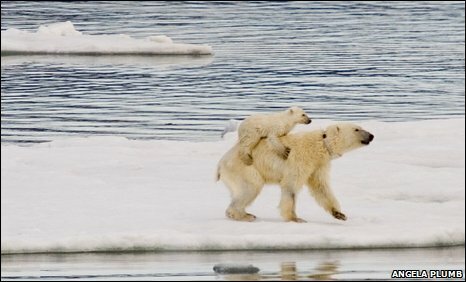 Witness the picture above, of a baby polar bear going for a ride on his mama bear’s back. Honestly? I’m not sure how that picture could get any cuter, since baby bears are about the most adorable wild animals on the planet. Maybe if a kitten was riding on the bear’s back, and the mama bear was wearing some kind of cute hat? This incredibly cute behavior is actually an important survival tool. The younger bears are obviously not as big or hardy as the adult model, so they lack the important layer of insulating fat that adult polar bears use to navigate through the harsh climate of the frozen north. Baby bears will hop on Pop when it’s time to leave the den or navigate through deep snow, but it’s pretty rare for a bear to be caught giving Junior a ride through water. Amateur photographer Angela Plumb’s capture of this event is pretty important evidence of a very rare bear survival technique.